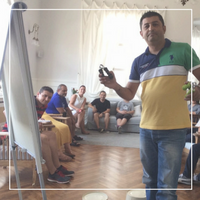 Our workshops and intensive programs have been designed and localized for Turkish learners who represent their company in an international environment. Each program can be customized to better fit our clients' needs. All workshops can also be re-designed as individual programs. Scroll down to see a full list of workshops and seminars. This workshop focuses on meeting the expectations of an international audience. There are many major differences between Turkish style and international style presentation skills. This workshop hones in on these key differences and creates multiple opportunities for participants to practice and present using these specifically international-style techniques. This workshop seeks to create a global business writing culture which will balance the cultural differences between the Turkish writing style and the writing styles of opposite culture types. This program has been localized and customized for the needs of Turkish professionals responsible for any form of written communication with an English-speaking audience including formal and informal emailing, memorandums, executive summaries and general statistical reports. This program teaches elevated language in a business context. Most importantly, this program will teach participants how to use and activate the high-level grammar necessary to explain projects clearly, persuade clients and customers, network, teleconference, negotiate deals, and motivate your team. We will use an interactive, real-world approach to help you speak elevated, professional English immediately and confidently. This program teaches participants how to present effectively for English-based national and international business communications. It specifically focuses on the elements of international presentations such as ‘kickers’, ‘transitions’, ‘sentence stress’, and the language associated with each portion of a presentation. This program is designed to assist you with developing and practicing an upcoming presentation. Your teacher will ensure that your next presentation will be high-impact and meet the standards of an international audience. Even if your level is as low as pre-intermediate, you can still give a great presentation. This program teaches participants the three principles of global business communication. The aim of good business writing is to avoid cultural miscommunications, and writing directly, politely, appreciatively, and professionally. The full program focuses on writing for all types of communication including emails, executive summaries, formal emailing, and statistical reporting. The aim of good business writing is to avoid cultural miscommunication, and writing directly, politely, appreciatively, and professionally. This program introduces participants to the three principles of global business writing – specifically for effective emailing. We will focus on both informal and formal emailing. This program focuses on easy ways to make your English sound more fluent to a native-English speaking audience. Day 1 of this workshop uses the skills participants already possess, and modifies them so that participants sound more like native speakers. Day 2 will introduce new language, and simulate life on the ground in an English-speaking country. Not only will you learn to speak English more like a native English speaker, you will also be able to understand native English speakers better. This program will increase your sales team’s ability to sell to any client anywhere in the globe – in English. The key facet of a great salesperson in the global marketplace is adaptability. An effective sales team can adapt their language and sales technique to the cultural expectations of the prospect. Therefore, this program’s content combines language skills, multiple sales techniques, and cross-cultural communication skills. This program teaches elevated language in a business context. Most importantly, this program will teach participants how to use and activate the high-level grammar necessary to explain projects clearly, persuade clients and customers, network, teleconference, negotiate deals, and motivate your team. We will use an interactive, real-world approach to help participants speak elevated, professional English immediately and confidently. This program focuses on developing your English voice. That begins even in the muscles you are using to speak English. By developing your English voice, native speakers will be better able to understand you and you will feel more confident in your ability to communicate. This program will prepare the participant for all aspects of the interview process including language, Q&A, polite questioning skills, body language mirroring and; of course, multiple role plays focusing on preparing the participant for different interview styles. For high-level professionals, basic communication ability is not enough. It is not going to be effective or get results. The final step of a learning a language is to learn how to use it strategically. Being able to use English strategically means that you understand two things: Schemata (Soft Skills) in cooperation with Linguistics (Language Skills). Understanding Schemata means you understand the function of the language, and Linguistics means you understand how to create your sentences based on grammar, structure, and syntax. This program combines both. Therefore, all participants will be introduced to the micro and the macro of English which is a combination of soft skills and language skills. When both concepts are understood, that’s when you can use English strategically. This programme is designed for your company’s key representatives, project and departmental managers or any other key personnel who are challenged with working in an international environment -- locally or in another country. Education and orientation is a key factor in determining if the working experience will be enjoyable and effective. This program focuses on cultural understanding in work life and in social life to allow for a smoother transition into a new environment. The participants should have at least a pre-intermediate level of English. English and Turkish are opposite languages. Hence, communication becomes more difficult and mistakes happen frequently when translating from Turkish to English. It is difficult to face our mistakes; therefore, this interactive seminar provides a fun and comfortable environment full of multimedia and humor that will open your eyes to mistakes that you may not know you are making, but are also easy to solve. In order to look at our mistakes and be able to laugh at them, we have created an original series of comedic videos that illustrate typical mistakes. You will learn grammar rules that you didn't know existed. You will correct common pronunciation mistakes, common spelling mistakes, and common errors in grammar and lexis. Especially during presentations and meetings, have you ever wondered what Turkish English speakers sound like to the rest of the world? Can your English represent your company for business purposes, or do you need to refine your vocal presentation techniques and accent in order to make a better impression? In this program, we will practice tips and vocal techniques to help English as a second language speakers sound clear and easily understandable with a neutralized accent, and impactful speaking style.